A European green crab invasion may be taking place in Puget Sound, and Washington Sea Grant intends to enhance its Crab Team this summer with more volunteers looking in more places than ever before. The second European green crab identified in Puget Sound was found in Padilla Bay, where three others were later trapped. Training is about to get underway, and anyone with an interest in furthering science while being exposed to the wonders of nature may participate. It’s not always good weather, but I’ve been inspired by the camaraderie I’ve witnessed among dedicated volunteers. The work involves going out to one or more selected sites each month from April into September with a team of two to four other volunteers. It is helpful to have folks who can carry the crab traps, plastic bins and other equipment. For details, check out the Washington Sea Grant website. As I reported last fall, the first dreaded green crab showed up in a trap deployed on San Juan Island. See Water Ways, Sept. 3. 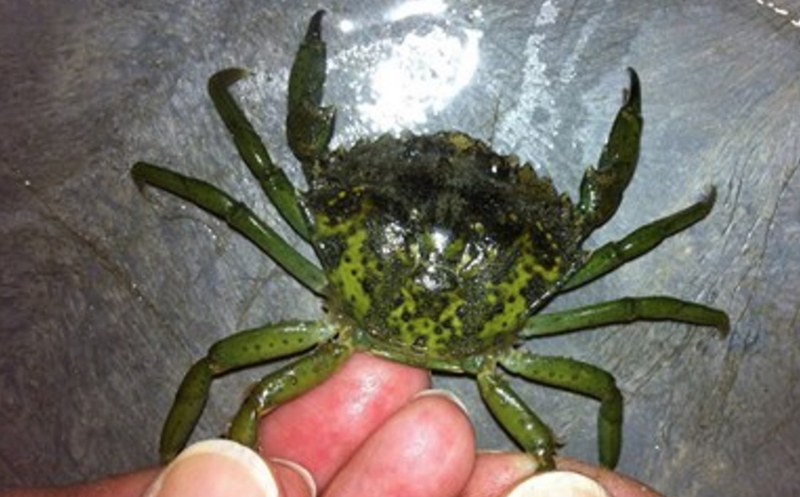 About three weeks later, a second green crab was found was found in Padilla Bay, about 30 miles southeast of the first one. See Water Ways, Sept. 24. Intensive trapping in Padilla Bay located three more. See Water Ways, Oct. 1. Whether green crabs find suitable conditions to allow their population to multiply is yet to be seen, but an extensive trapping effort can help identify reproductive success, locate new areas of invasion and remove individuals from the breeding population. It’s an interesting scientific endeavor for Crab Team members. Nobody wants to find green crabs, because of the threat that they pose. Yet these volunteers know that their work may help prevent the destruction of an ecosystem that has stood the test of time. To gather background data, members count other species caught in the traps and measure their average size during the trapping period. The upcoming Crab Team training will teach citizen science volunteers how to place the traps, identify and measure the crabs that get caught and record the data compiled into an extensive database.